At Plumbing and Drains Solutions, our plumbers are experts when it comes to locating and repairing slab leaks. We are always thinking outside the box and look for the best fix for any issue. Since we are the best slab leak detection company in San Diego, our expert technicians look for the most cost-efficient and reliable solutions for your repairs. Our leak detection experts make every customer our priority and work until our job is complete. Reach out to Plumbing and Drains Solutions at (619) 345-5550. Ask about your free estimate! Any leak has the potential to damage your home, including a slab leak. That is why we have state-of-the-art tests, techniques, and equipment that allow us to solve just about any problem. In the meantime, there are steps that you can take to manage the leak on your own. Locate your master water supply box and turn your main water valve clockwise. This will shut off all of your water so that your leak does not worsen and water is not being wasted. When a house is built on a slab there is always the chance that there can be a leak in the pipes that are located beneath the concrete slab foundation. Depending on your location and the kind of copper used in the construction of homes in your area (as well as the aggressiveness of your water) your home’s pipes may be prone to slab leaks or in need of repair. When damage occurs it may also affect sewer lines and therefore a sewer video inspection may be needed to do a sewer repair. No matter what the issue is, we have the bases covered. Due to the nature of slab foundations, a slab leak may not be immediately identifiable. Sometimes it is simply a matter of recognizing that your carpets or floors are inexplicably damn (even wet), but sometimes it is more subtle. Sometimes the key symptom is an unreasonably high water bill that doesn’t fit with your home’s water usage. If you are unsure as to whether or not you have a slab leak, you can call the professionals at Plumbing and Drains Solutions. A professional technician will come out to your home and evaluate your situation and let you know if there is a problem and what your options are for having it addressed. At Plumbing and Drains Solutions we have technicians that have been personally selected and trained in all the very latest methods of electronic slab leak identification and who are knowledgeable regarding repair options and suggestions to help alleviate your problem. They will come to your home with their state-of-the-art slab leak identification equipment to assess your problem and offer suggestions. 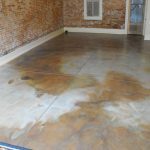 If it is found that you do indeed have a slab leak, you can rest assured that by contacting the professionals at Plumbing and Drains Solutions your slab leak concerns will soon be a thing of the past, as will your high water bills and/or wet carpets! Our reputation for excellent customer service and plumbing professionalism has been earned through our commitment to ensuring that our customers’ needs are met in a timely and efficient matter, and our care for your slab leak issue will receive the very same attention to detail that all of our other services offer. Thanks to our experience and training, we are the best slab leak detection company in San Diego and have the ability to provide you with an individualized analysis of your problem that can help lead us to a solution. One of the many reasons we are the best slab leak repair company in San Diego why customers love Plumbing and Drains Solutions is because we can customize every service to fit your needs. Call us today for a plumbing service estimate from San Diego’s top rated plumbers. Contact us today for quality slab leak repairs in San Diego. You can reach us at (619) 345-5550.